A few words about Archaeological Museum.. It is located in the capital of Thassos (Limenas). It is built near the ancient Agora. The museum, one of the most important peripheral museums of Greece, exhibits collections of archeological finds of unique wealth, varying from the 7th century BC to the 7th century AD. Important findings from the Paleolithic to the Roman era paint a vivid picture of one of the most important Aegean civilizations. It is housed in a 1934 building, which was recently extended. 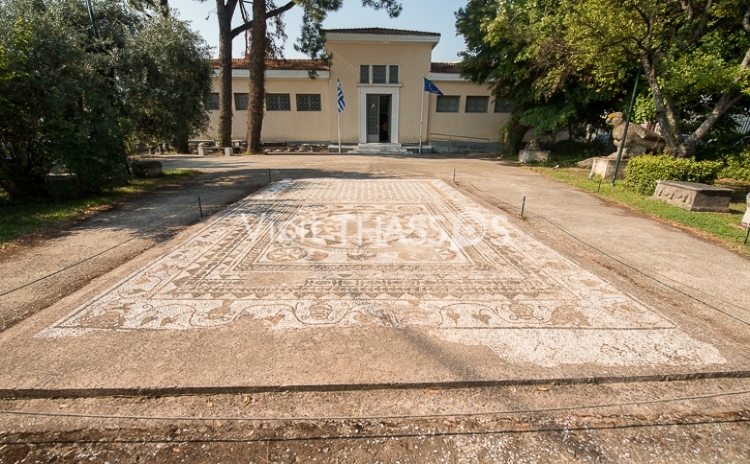 It comprises of around 1700 exhibits from the island of Thassos and gathered after many years of research of the French and Greek archaeological departments. Among the most important exhibits are the towering archaic Kouros, intended for the temple of Apollo, the goddess embossed in a recess and Aphrodite (Venus) on a dolphin. Details of everyday life are presented during different historical periods which have left their mark on the island as well as the creations and culture of the first inhabitants. Particular emphasis is given to the presentation of the ceramic during the Iron Age, the rock paintings and the anthropomorphic columns, which represent some of the oldest monumental sculptures that perhaps symbolized gods or heroes. You will admire prehistoric jewelry and other minor objects such as pots, idols, small lamps and jewelry. The museum also features an amphitheatric projection hall and a temporary exhibition hall. The museum, one of the most important peripheral museums of Greece, exhibits collections of archeological finds of unique wealth, varying from the 7th century BC to the 7th century AD.